I am a historian of the Middle Ages with a research focus on the history of the crusades. My main interest is in the perceptions and representations – both textual and visual – of the crusading movement in the twelfth and thirteenth centuries. In other words, I am less concerned with what had actually happened than with what contemporaries and near-contemporaries thought had happened. 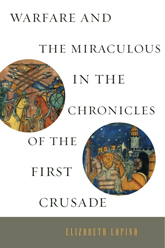 In my first monograph, Warfare and the Miraculous in the Chronicles of the First Crusade (Penn State, 2015), I examine several chronicles of the First Crusade to uncover the existence of sophisticated and often conflicting interpretations of the event. I am particularly interested in one key theme that one finds in all of the chronicles: sacralization of warfare. Hence, I pay close attention to accounts of miracles – especially those reported to have taken place on the battlefield – found in the chronicles. In my second monograph, provisionally entitled Depicting the Holy War: Crusader Imagery in Programs of Mural Paintings in France and England in the Twelfth and Thirteenth Centuries, I develop some of the ideas found my earlier work. In contrast to my first monograph, however, in this one I deal almost exclusively with visual sources. My aim is to demonstrate that, compared to texts, images provide a different point of view on the perceptions of the crusades, the crusaders and their Muslim enemy. The five programs of mural paintings that I examine demonstrate that crusades had a major impact on attitudes towards violence far away from major theaters of crusading warfare, in England and France. My third major project deals with knightly culture on crusades and the Latin States. I examine such topics as tents, gambling, hunting, music, and gift giving. I attempt to uncover the ways, in which crusades transformed both practices and ideas proper to knights in Western Europe. These transformations took place for two reasons: the belief that crusades were “holy wars,” the participants of which had to adhere to higher moral standards, and encounters with Muslim and Eastern Christians inhabitants of the Middle East. Finally, one of my long-standing interests has to do with representations of nature in medieval chronicles. I would like to understand the complex relationship between empirical experience of nature and interpretations and transformations of this experience in medieval texts. Elizabeth Lapina (Co-editor), Nicholas Morton (Co-editor). The Uses of the Bible in Crusader Sources. Brill, 2017. 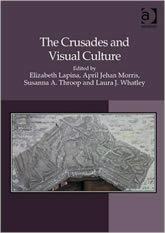 “Crusades, Memory and Visual Culture. 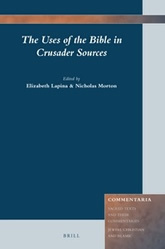 Representations of the Miracle of Intervention of Saints in Battle,” in Remembering the Crusades and Crusading, edited by Megan Cassidy-Welch. London and New York: Routledge (2017): 49-72. “Gambling and Gaming in the Holy Land: Chess, Dice and Other Games in the Sources of the Crusades,” Crusades 12 (2013), 121-132. “Maccabees and the Battle of Antioch (1098).” Dying for the Faith, Killing for the Faith: Old-Testament Faith-Warriors (Maccabees 1 and 2) in Historical Perspective, ed. Gabriela Signori, 147-159. Leiden: Brill, 2012. “St. Demetrius of Thessaloniki: Patron Saint of Crusaders.” Viator: Medieval and Renaissance Studies 40 (2009): 93-112. “La représentation de la bataille d’Antioche (1098) sur les peintures murales de Poncé-sur-le-Loir.” Cahiers de Civilisation Médiévale 52 (2009): 137-157. “Nec signis nec testibus creditur: the Problem of Eyewitnesses in the Chronicles of the First Crusade.” Viator: Medieval and Renaissance Studies 38 (2007): 117-139. “The Paintings of Berzé-la-Ville in the Context of the First Crusade and the Reconquista.” Journal of Medieval History 31 (2005): 309-326.